Speaking truth to power. The village women taking on the palm oil giant. The Société Financière des Caoutchouc (Socfin) group is one of the world’s biggest plantation companies. 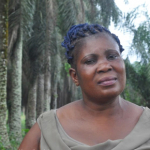 In Cameroon, a bitter land rights struggle has unfolded between villagers and Socfin’s local subsidiary Socapalm, which owns six palm oil concessions in the country. In this Fern report and photo story women give testimony on the impacts that the Socapalm plantations have over their territories and lives, how the company has expanded its plantations onto community land, polluted the environment, and prevented villagers from processing their own palm oil.